In A Midsummer Night’s Riot [Josh] Sticklin plays Ross, a witty, randy Belfast teenager who has a dream: to be a famous pro golfer with a gorgeous girlfriend. But he is pitched into nightly summertime street riots between Protestant and Catholic youth, and he’s so strapped for cash he cannot afford golf clubs. As in Basra Boy and Cuchullian, Sticklin bounds about the stage, peoples it with a cast of sharply drawn characters through uncanny insta-impersonation (male and female, young and old), and captivates with a torrent of waggish jokes and lickety-split narration of a transfixing tragicomic story. When I first saw Sticklin’s performance in a one-person work by Jenkinson, I could have sworn that he, like the writer, is a Belfast native. He’s not, but onstage he still sure seems so. 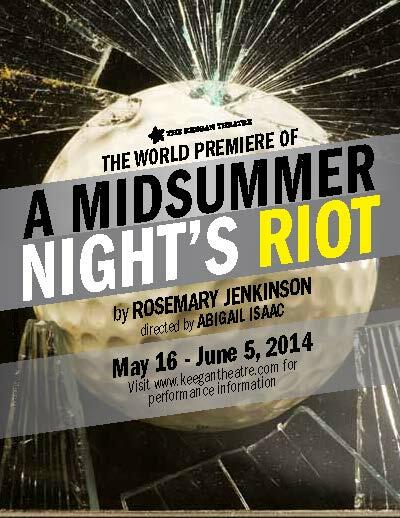 In A Midsummer Night’s Riot, the part and the player are a perfect fit. Projections designed by Lighting Designer Allan Weeks contribute strikingly to the play’s vivid sense of place. Costume Designer Kelly Peacock has given Ross clothes to wear (when he’s not in his bedroom undressed) that clearly speak teen street style. The utilitarian set by Michael Innocenti and Colin Smith, serves ably as Sticklin makes each space, stairway, and platform his own. If you missed Basra Boy, if you missed Cuchullain, don’t let this one pass you by. It’s lightning in a bottle—as electrifying as solo theater gets.